For a start the Garmin G5 Approach will wipe the smug smiles from your boss and friend’s faces when they see you hit the ball closer to the target then they can, this will certainly put a smile on your face. The Garmin G5 Approach Waterproof Touch screen Golf GPS is Garmin’s first touch screen handheld GPS device specially designed for golf. If you’re ready to reduce your strokes and are up for the next challenge, then the Garmin G5 can help you get there. It shows a detailed view of the entire courses in color and uses touch screen technology to give information on distances to fairways, hazards and greens and measure individual shot distances. It also helps analyze your game by letting you view scores of up to 4 players and keep track of the primary user’s game statistics. The Garmin G5 Approach is easy to use, it doesn’t even have a set-up procedure. Just put the batteries in turn on the unit, and you’re ready to play. At present, the Garmin G5 has 16,500 American and Canadian course maps that are already preloaded. Unlike some competitors, there are no subscription fees required to access the database of golf courses. You can preview any course in the database using the Preview Mode. The Green View provides a detailed view of the green and lets you touch-and-drag the pin location for more precise readings. The Garmin G5 Approach delivers accurate information in its map illustrations and distance readings. Once you get used to it, its simple touch screen interface lets you easily access the system features. The touch targeting feature lets you measure the target distance by touching anywhere on the screen. With the Garmin G5 you’ll be able to target anywhere on the fairway and see any obstacles in your path. Touch any point on the screen and the Garmin G5 Approach gives the exact distance to that point. It shows exact distances to targets and hazards from where you’re currently standing. It also automatically updates your position as you move. Using this touch screen and touch targeting technology takes some time to get used to. Sometimes the device doesn’t recognize the exact position you’re aiming for which you’re trying to point through your finger. A good remedy for this would be to use a pen or pencil for more accurate positioning. 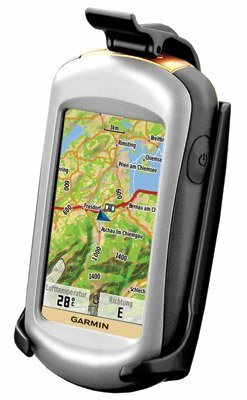 This Garmin G5 GPS unit weighs in at a low 6.8 ounces and is slim enough to fit in your pocket. Weighing 6.8 ounces with batteries, the Garmin G5 Approach comes with a sturdy and waterproof shell. This rugged design will enable it to withstand tough conditions and rough handling in the course. It has a color screen display that is sharp and clear, with a size of 1.53” x 2.55” (3′ diagonal) and resolution of 240 x 400 pixels that can be seen in bright outdoor conditions. Distance numerals shown on screen are large and can be read easily. The only problem with the G5 golf GPS is its short battery life. It requires two AA batteries that won’t last to the end of two rounds. So if you’re the type who plays a lot, remember to bring rechargeable batteries. But it’s really bothersome to be changing batteries in the middle of play. Armed with the information that the Garmin G5 gives while playing, this golf GPS device will definitely help you speed up and improve your game.